The chart shows components of GDP in the UK from 1992 to 2000. In this question, you are being asked to write a report which describes changes over time, in this case from 1992 to 2000. To do this you need to use language expressing change and appropriate tenses. The bar chart compares two major industrial sectors contributing to the UK’s GDP in the period between 1992 and 2000, as a percentage of total GDP. Overall, it can be seen that while both sectors increased as a percentage of total GDP, the IT industry grew at a far more rapid rate when compared to the the services sector. Having written the overview, you should now look at the detail. Remember, though, that you only need to write a short report (at least 150 words), so you only need to summarize the most important details. At the beginning of the period, in 1992, the service industry accounted for 4% of total GDP, whereas IT contributed just over 6 per cent. Over the next four years, both sectors experienced overall growth as a proportion of total GDP, although there was a slight reduction for IT between 1994 and 1996. While IT remained the larger of the two sectors, the gap between them shrank to around 1%, half of what it had been in 1992. And here is a paragraph describing the trends from 1996 to 2000. However, after 1996 the growth of the two sectors was noticeably different. The IT sector’s proportion of GDP increased quite sharply to 12% in 1998 and then to nearly 15% in 2000, while that of the service Industry rose only slightly, increasing only marginally from 1998 to 2000. You could also add a sentence describing the situation in 2000. 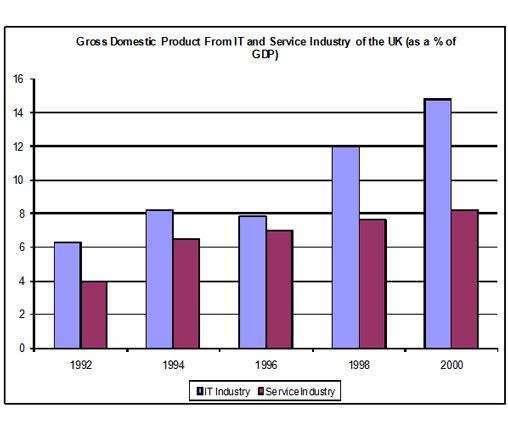 At the end of the period, the IT industry’s proportion of total GDP was almost twice that of the service industry. To get more information and tips, read my article on the IELTS Writing Test.